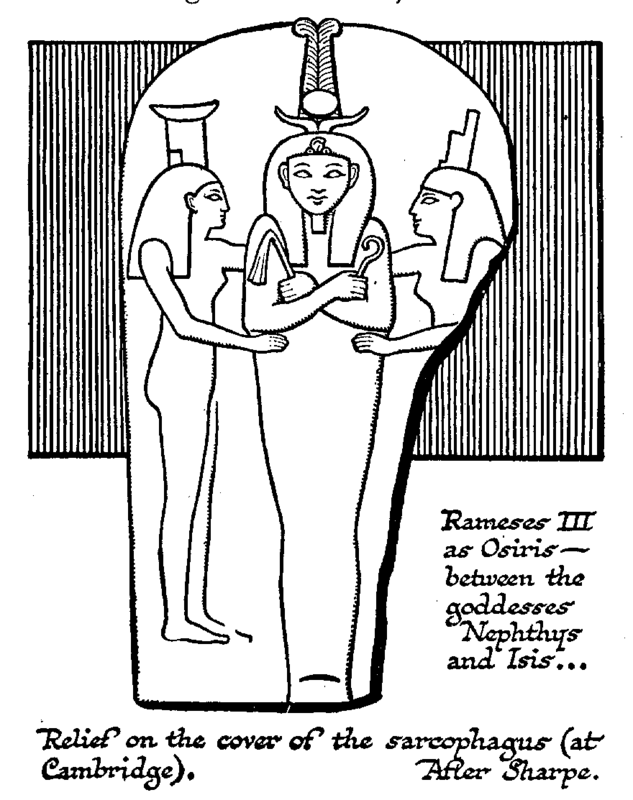 Rameses III as Osiris — between the goddesses Nephthys and Isis. Relief on the cover of the sarcophagus (at Cambridge). After Sharpe. Inscription (round the edges of cover) as far as decipherable: “Osiris, King of Upper and Lower Egypt, lord of the two countries … son of the Sun, beloved of the gods, lord of diadems, Rameses, prince of Heliopolis, triumphant! Thou art in the condition of a god, thou shalt arise as Usr, there is no enemy to thee, I give to thee triumph among them …”. BUDGE, Catalogue, Egyptian Collection, Fitzwilliam Museum, Cambridge. The story of priest and king in Egypt is similar to, but by no means parallel with, that of Babylonia. The kings of Sumeria and Assyria were priests who had become kings; they were secularized priests. The Pharaoh of Egypt does not appear to have followed precisely that line. Already in the very oldest records the Pharaoh has a power, and importance exceeding that of any priest. He is, in fact, a god, and more than either priest or king. We do not know how he got to that position. No monarch of Sumeria or Babylonia or Assyria could have induced his people to do for him what the great pyramid-building Pharaohs of the IVth Dynasty made their people do in those vast erections. The earlier Pharaohs were not improbably regarded as incarnations of the dominant god. The falcon god Horus sits behind the head of the great statue of Chephren. So late a monarch as Rameses III (XIXth Dynasty) is represented upon his sarcophagus (now at Cambridge) bearing the distinctive symbols of the three great gods of the Egyptian system. He carries the two sceptres of Osiris, the god of Day and Resurrection; upon his head are the horns of the cow goddess Hathor, and also the sun ball and feathers of Ammon Ra. He is not merely wearing the symbols of these gods as a devout Babylonian might wear the symbols of Bel-Marduk; he is these three gods in one. We find also a number of sculptures and paintings to enforce the idea that the Pharaohs were the actual sons of gods. The divine fathering and birth of Amenophis III, for instance (of the XVIIIth Dynasty), is displayed in extraordinary detail in a series of sculptures at Luxor. Moreover, it was held that the Pharaohs, being of so divine a strain, could not marry common clay, and consequently they were accustomed to marry blood relations within the degrees of consanguinity now prohibited, even marrying their sisters. The struggle between palace and temple came into Egyptian history, therefore, at a different angle from that at which it came into Babylonia. Nevertheless, it came in. Professor Maspero (in his New Light on Ancient Egypt) gives a very interesting account of the struggle of Amenophis IV with the priesthoods, and particularly with priests of the great god, Ammon Ra, Lord of Karnak. The mother of Amenophis, IV was not of the race of Pharaoh; it would seem that his father, Amenophis III, made a love match with a subject, a beautiful Syrian named Tii, and Professor Maspero finds in the possible opposition to and annoyance of this queen by the priests of Ammon Ra the beginnings of the quarrel. She may, he thinks, have inspired her son with a fanatical hatred of Ammon Ra. But Amenophis, IV may have had a wider view. Like the Babylonian Nabonidus, who lived a thousand years later, he may have had in mind the problem of moral unity in his empire. We have already noted that Amenophis III ruled from Ethiopia to the Euphrates, and that the store of letters to himself and his son found at Tel-Amarna show a very wide range of interest and influence. At any rate, Amenophis IV set himself to close all the Egyptian and Syrian temples, to put an end to all sectarian worship throughout his dominions, and to establish everywhere the worship of one god, Aton, the solar disk. He left his capital, Thebes, which was even more the city of Ammon Ra than later Babylon was the city of Bel-Marduk, and set up his capital at Tel-Amarna; he altered his name from ?Amenophis?, which consecrated him to Ammon (Amen) to ?Akhnaton?, the Sun’s Glory; and he held his own against all the priesthoods of his empire for eighteen years and died a Pharaoh. 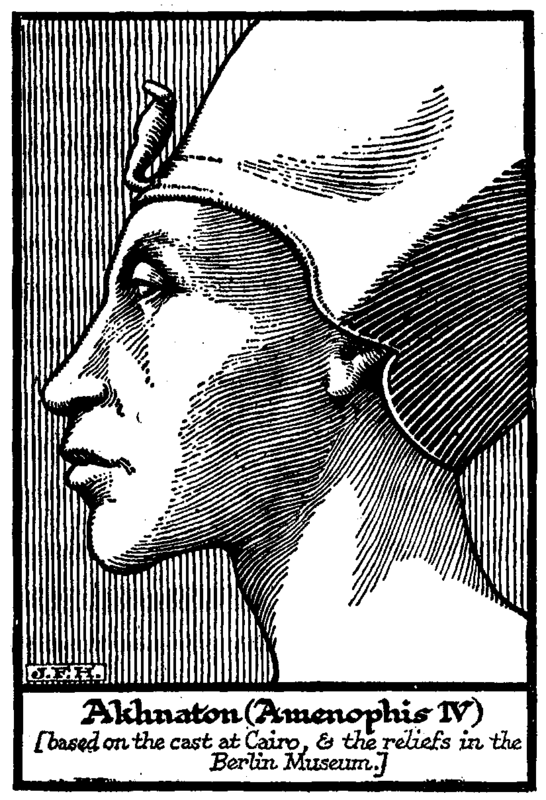 Akhnaton (Amenophis IV) based on the cast at Cairo and the relief in the Berlin Museum. Opinions upon Amenophis IV, or Akhnaton, differ very widely. There are those who regard him as the creature of his mother’s hatred of Ammon and the uxorious spouse of a beautiful wife. Certainly he loved his wife very passionately; he showed her great honour?Egypt honoured women, and was ruled at different times by several queens?and he was sculptured in one instance with his wife seated upon his knees, and in another in the act of kissing her in a chariot; but men who live under the sway of their womenkind do not sustain great empires in the face of the bitter hostility of the most influential organized bodies in their realm. Others write of him as a ?gloomy fanatic?. Matrimonial bliss is rare in the cases of gloomy fanatics. It is much more reasonable to regard him as the Pharaoh who refused to be a god. It is not simply his religious policy and his frank display of natural affection that seem to mark a strong and very original personality. His aesthetic ideas were his own. He refused to have his portrait conventionalized into the customary smooth beauty of the Pharaoh god, and his face looks out at us across an interval of thirty-four centuries, a man amidst ranks of divine insipidities. A reign of eighteen years was not long enough for the revolution he contemplated, and his son-in-law who succeeded him went back to Thebes and made his peace with Ammon Ra. To the very end of the story the divinity of kings haunted the Egyptian mind, and infected the thoughts of intellectually healthier races. When Alexander the Great reached Babylon, the prestige of Bel-Marduk was already far gone in decay, but in Egypt, Ammon Ra was still god enough to make a snob of the conquering Grecian. The priests of Ammon Ra, about the time of the XVIIIth or XIXth Dynasty (circa 1,400 B.C. ), had set up in an oasis of the desert a temple and oracle. Here was an image of the god which could speak, move its head, and accept or reject scrolls of inquiry. This oracle was still flourishing in 332 B.C. The young master of the world, it is related, made a special journey to visit it; he came into the sanctuary, and the image advanced out of the darkness at the back to meet him. So it was that the priests of Egypt conquered their conqueror, and an Aryan monarch first became a god.